Specsavers founder returns home to present book award, Dame Mary Perkins, attended CrimeFest on Saturday 19 May to present author, Lee Child, with his Platinum Bestseller Award. The Nielsen Bestseller Awards celebrates the UK’s bestselling books each year. Originally published in 1997, Lee Child has sold one million copies nationwide of his bestselling thriller novel; Killing Floor: Jack Reacher. ‘Reading is something that Specsavers is very passionate about, as of course good eyesight plays an essential role in it, and many of our customers enjoy nothing better than losing themselves in a good book, myself included,’ says Dame Mary. 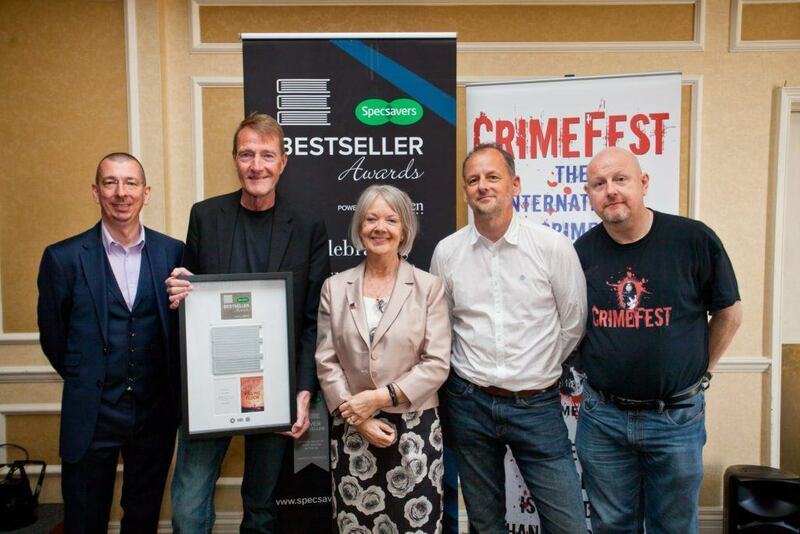 Adrian Muller, CrimeFest co-host, says: ‘Lee Child has been one of CrimeFest’s most avid supporters since day one. So it was a great pleasure that we were able to provide Dame Mary Perkins and Specsavers – well known promoters of crime fiction – a platform to present this prestigious award. Since launching in 2001, the Specsavers Bestseller Awards have recognised some of the UK’s most prolific writers including Tom Kerridge, Paula Hawkins, Philip Pullman and Cecilia Ahearn.